AMD's Socket AM2 processor has given the DDR2 memory market a much needed revitalizing. 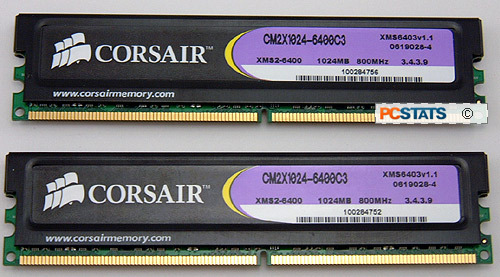 In anticipation of computer hardware enthusiasts jumping over to the new platform, memory manufacturers have released lower latency DDR2 memory modules in the weeks prior but it appears that Corsair has turned it up a notch. Enhanced Performance Profiles (aka EPP) is a technology was pioneered by nVIDIA and Corsair, but the open standard has now been adopted by Mushkin to OCZ and Kingston as well. Enhanced Performance Profiles are the next logical step to improve system performance by allowing the BIOS to dynamically overclock the memory subsystem. With CPU scaling a standard feature for most higher end motherboards, having memory that can scale with the rest of the system just makes sense. From what has passed through the PCSTATS test labs so far, Enhanced Performance Profiles compatible memory does make a noticeable difference in games, and it is a great way for novice overclockers to learn the ropes. Even if you're an experienced overclocker, you can still learn quite a bit from Enhanced Performance Profiles memory. For instance, watch how EPP adjusts the lesser known memory timings like tRRD, tREF or tWR - and then note how the system reacts. In this review PCSTATS will be testing Corsair's latest 240 pin DDR2-800 memory, the 2GB Twin2X2048-6400C3 kit. Like the Twin2X2048-6400C4 that we had the opportunity to test previously, this set of memory is compatible with Enhanced Performance Profiles. What sets the 6400C3 kit apart from the rest are its timings... and they are some of the lowest anywhere. According to Corsair, the Twin2X2048-6400C3 memory is rated to run at DDR2-800 speeds with CAS latency timings of 3-4-3-9, albeit with a voltage of 2.2V. This memory comes with a huge price tag however, retailing for $505 CDN ($454 US, £243 GBP). Ouch! The current JEDEC DDR2-800 standard calls for timings of 5-5-5-15 with a voltage of 1.8V and that's what's programmed into the SPD. Enhanced Performance Profiles can take over with a compatible motherboard, and improve things quite nicely. Socket AM2 Athlon64's will benefit most from the low latency memory, however Intel users with DDR2 compatible Core 2 Duo, Pentium 4/D/XE systems can also use this memory. Aside from the price tag, the Corsair Twin2X2048-6400C3 looks near identical to Corsair's other DDR2 DIMMs, so pick memory carefully when buying! Memory that is Enhanced Performance Profiles compatible is dubbed "SLI Ready" on the packaging. 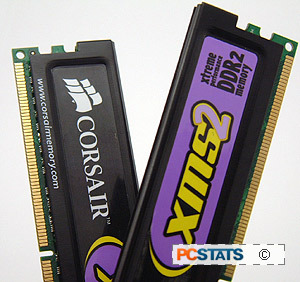 Corsair list the Twin2X2048-6400C3 as being capable of running DDR2-800 speeds with 3-4-3-9 timings at 2.2V. To achieve this, Corsair equip the two 1GB DDR2 DIMMs with Micron D-revision DRAM modules, then are hand test each on a nForce 590 SLI platform to see how fast it can go. Corsair also employs an old overclocker's trick, it increases the voltage to get the higher speed and tighter timings to stick. Please note that with the Twin2X2048-6400C3 running with 2.2V, things can get quite hot, good system airflow is mandatory. Corsair and nVIDIA have co-released a memory-centric standard called Enhanced Performance Profiles (EPP), which for the moment is specific to the nVidia nForce 500-series chipset and Socket AM2 AMD Athlon64 platform. At the moment EPP memory is only compatible with the nVIDIA nForce 590 SLI chipset, but VIA and Intel are expected to follow suit. The idea is being proposed to JEDEC as an open standard. We expect all chipset manufacturers will adopt EPP memory support in the BIOS for high end products. If you are wondering whether the set of memory you're looking for is EPP compatible, just watch out for the 'nVIDIA SLI Ready' sticker. Since nVidia is first out of the gate with this standard, it's stickers will signify EPP compliant memory modules. If it has that sticker on the packaging then it's EPP compatible, if it doesn't then it's not. On AMD test systems, we're only interested in seeing how high we can go with the memory running 1:1, as running with other dividers puts the overclocking bottleneck elsewhere and not with the system memory. The DDR2 RAM latency must run at its lowest possible setting, as quick access is more important to the CPU design. Just for arguments sake, we will also be conducting overclocking tests to see how high the memory will go with lax timings (5-5-5-15), although we will only benchmark the system with the tight memory timings mentioned above. Let's get started with some overclocking next!